Crocs Philippines is back with another shopping bonanza! Get ready for the biggest Crocs Megasale event! 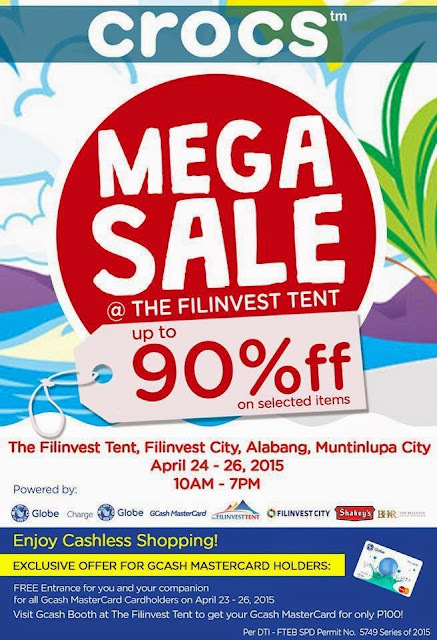 Up to 90% price slash on a wide selection of merchandise awaits you at Crocs Megasale happening at The Filinvest Tent from April 24 – 26, 2015! Don't miss out on the biggest Crocs sale at The Filinvest Tent. The Crocs Megasale will commence three days from now. Like Crocs Philippines on Facebook and follow @crocsph on Twitter for updates on the Crocs Megasale 2015.